You are unique! These three words imply something amazing. In the whole universe, there is no one like you. You are not “average” and you are not “normal”—no one is actually average, normal, or regular. You may share a few similar traits with other people: You may wear the same size yoga shirt as do millions of others; your shoe size may be the same as your sibling’s; you are made up of identical protons, neutrons, and electrons, as is everyone you know. But when you examine the whole of who you are, these particular parts come together in a way that forms a “you” that is totally and indisputably unique. The nature of human variation has been largely ignored in both medicine and the fitness world (including the yoga industry). In advising how to train an elite athlete, Stuart McGill, a medical researcher of lower back disorders, notes: “Each person has different proportions of body segment lengths, muscle insertion lengths, muscle to tendon length ratios, nerve conductance velocities, intrinsic tissue tolerances, etc… Imposing a stereotyped ‘ideal’ technique will often prevent an athlete from reaching their full potential.”3 My own esteemed yoga teacher, Paul Grilley, recognized that this applied to yoga as well, and in 2004 created an influential DVD, Anatomy for Yoga, which shows how our unique biology affects our yoga practice. FIGURE 1: Nadia (A) is slightly internally rotated in the hips due to an anteversion of her hip sockets, and her legs are straight. Margot (B) has a distinct varus of the legs, causing her bowlegged appearance. Her hips are also quite externally rotated due to retroversion of her hip sockets and femoral torsion, causing her feet to point outwards—which is a natural alignment for her, but not for Nadia. 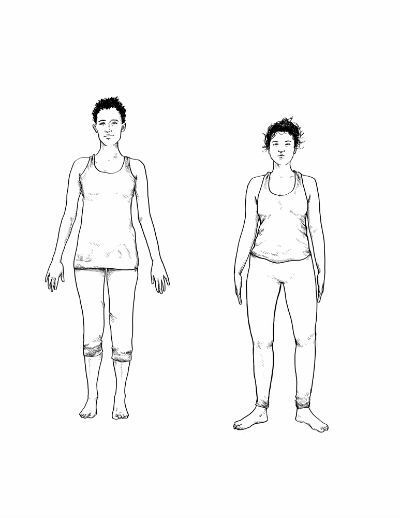 FIGURE 2: These anatomical variations affect not only our appearance, but also our ability to do yoga postures. Margot (B) finds it easier than Nadia (A) to get her knees to the floor in butterfly pose (baddhakonasana). Just as no one else has your dental pattern, it’s also true that no one else has your bone structure, your spine, or your hips. There are things you can do right now, there are things you will be able to do in time, and there are things you will never be able to do. This is not a critique of your abilities or a reflection of your personality or a flaw that needs fixing—this is simply the reality of your existence. A five-foot-tall ballerina will never play right tackle for the Seattle Seahawks, and the right tackle for the Seahawks will never win an Olympic gold medal for figure skating. This does not mean that the ballerina is flawed or the right tackle is lazy. “DIFFERENCES AREN’T DEFICITS,” said population geneticist Theodosius Dobzhansky.4 There are many ways we are different, and that’s okay. Sometimes the differences have consequences, and sometimes they don’t. The differences may become a problem when we either ignore or deny them. They are real, and that is normal. Think of the ways we can be measured: height, weight, age, education, income level, family size, city of upbringing, blood pressure, heart rate, the length of our arms relative to our spine, the retroversion of our hip sockets, the torsion of our femurs, tibia, and humerus, the amount of curvature in our legs…the list can go on and on. In any one of these categories, you might fall within the “average range,” but when you add in all the other parameters, you move far away from being an average person. No one is average. This means that whatever works for an “average person” (who does not actually exist) may not work for you. To quote Roger Williams once again: “Practically every human being is a deviate in some respects.”1 There is no normal and no abnormal. There is only you in all your uniqueness, and this uniqueness will determine what, of all life’s offerings, is available for you to partake in—and what you should, with wisdom, leave on the plate. FIGURE 3: Comparing femoral torsion: Margot’s femur on the left has a negative anteversion of –4°, and she will find external rotation relatively easy. Nadia’s femur on the right has an anteversion of 47°, and she will find internal rotation relatively easy. Imagine attending a yoga class where the teacher believes everyone can, eventually, do lotus pose (padmasana). 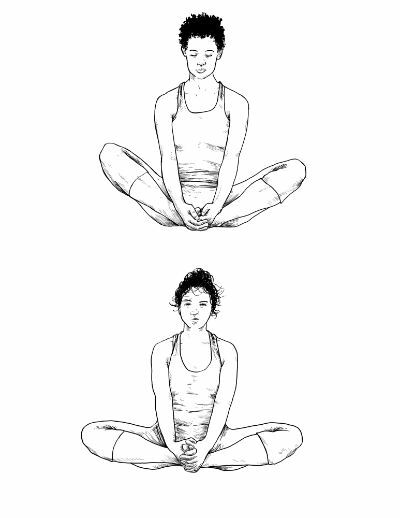 Maybe not today, but with diligence, practice, and a firm guiding hand (and with the right Lululemon pants and the best Himalayan incense), the teacher can show you how to get into this challenging cross-legged posture. What if you have never been able to sit cross-legged comfortably? You try—you ignore the little tweaky feelings in your knees until one day, the pain escalates into a burning fire that won’t stop even after class is over. You have torn your medial meniscus and are no closer to doing lotus pose than when you started yoga. The teacher has been ignoring the reality of your uniqueness. Due to the shape of your pelvis and femurs, you will never be able to do lotus pose, and trying to get there is destroying your knees. Yoga is a self-selecting practice. Those who have bones shaped in a way that facilitates doing certain postures keep working and progressing. They stretch out all the tensile resistance that prevents achieving their maximum range of motion, and they get to their desired positions. However, those whose bones are not shaped so optimally, who are not stopped by tension but instead have reached compression (where the bones are hitting each other), will never be able to do certain poses. They quit in frustration, convinced that some deep personality flaw is preventing their progress, a delusion secretly shared by some teachers. It would sure be nice if we all looked like the drawings in the anatomy books, and if our skeletons all looked like the plastic skeleton hanging in the corner of an anatomy classroom. But we aren’t, and they don’t. You are unique, what you can do is unique, and so should be your yoga practice. It is your body! Why not do your yoga? 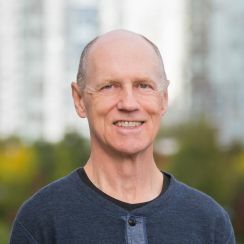 In future articles, Bernie Clark will give examples of how our uniqueness and the natural variation in our bodies will dictate how our yoga practice will evolve. 1) See Roger Williams, Biochemical Individuality (New York: McGraw-Hill Professional, 1998). 2) Cited in Roger Williams, Biochemical Individuality, 1–2. 4) Quoted in Kate Douglas, “Reaping the Whirlwind of Nazi Eugenics,” New Scientist, July 14, 2014. The pictures of the femurs reproduced with the kind permission of Paul Grilley.